I was innocently thinking about an organic cantaloupe that was sitting in the refrigerator and wondering when I will get around to eating it. I had some beautiful organic strawberries too. And I have a husband who, in his quest to eat less sugar, enjoys a nice dessert without it. 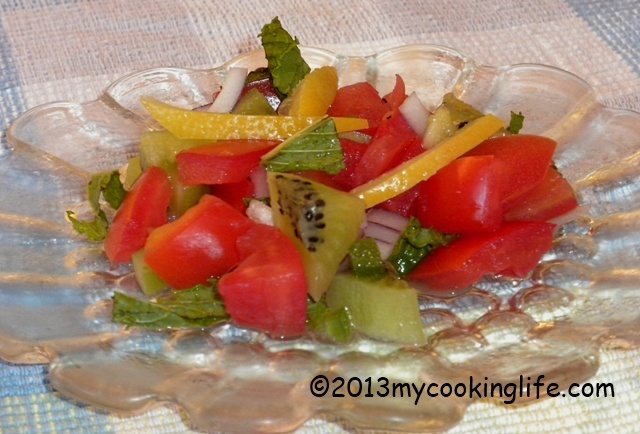 My usual pattern when it comes to creating food dishes or meals is that I think about color. Cantaloupe and strawberries would look beautiful together! And that was how I came up with the idea of strawberry cantaloupe pie which I’ve never made or heard of before. Time to experiment! Make a single pie crust and pre-bake it. Mine was 1 1/2 cups of organic whole wheat pastry flour and 2 pinches of sea salt. Combine that. Cut in some oil–about 1/3 cup and then some water until you’ve got a flaky dough consistency. Roll it out, arrange it in the pie plate and bake at 350 degrees for 20-25 minutes. Let that cool. Peel and cut the cantaloupe in chunks and blend this without extra water until it is thick and smooth. My Vita-Mix did a great job for me, but you can use a regular blender. In a small sauce pan, slowly heat the almond milk and agar. It will need to simmer several minutes until the agar is completely dissolved, so don’t use high heat or the mixture will boil off too much. Dissolve the kuzu powder in a little bit of water and add to the cantaloupe mixture. Stir continuously until the mixture, which up to now had a milky look, changes. When the kuzu is totally cooked into the mixture it will become less milky and thicken. Add a small squeeze of lemon juice to brighten up the filling. Arrange the half strawberries in the bottom of the cooled pie crust and pour in the cantaloupe filling. Chill until firm. Garnish with fresh sliced strawberries. The verdict: Nice texture. Naturally sweet. Sweetness will depend on how sweet the fruit is. Almond milk flavor takes over a little too much, even though there was only a small amount of it. Note to self–next time try rice milk or coconut milk. Finding pretty things for spring is what I do—in the clothing store, on my outdoor ventures and in my kitchen. I hope you liked my bright red strawberry pancake sauce! Here’s another pretty thing I whipped up for a whole-grain salad. This time I chose a gorgeous ripe mango to make a piquant sauce for quinoa and black bean salad. Find a ripe, un-bruised mango and remove the meat. Throw the mango into a high-speed blender or food processor with juice of half a lemon, a pinch of sea salt and a flavored white balsamic vinegar of your choice. (I used a Hawaiian coconut white balsamic and it was absolutely fabulous!) If you don’t have a flavored vinegar, it is still going to be delish with just a well-aged white balsamic. 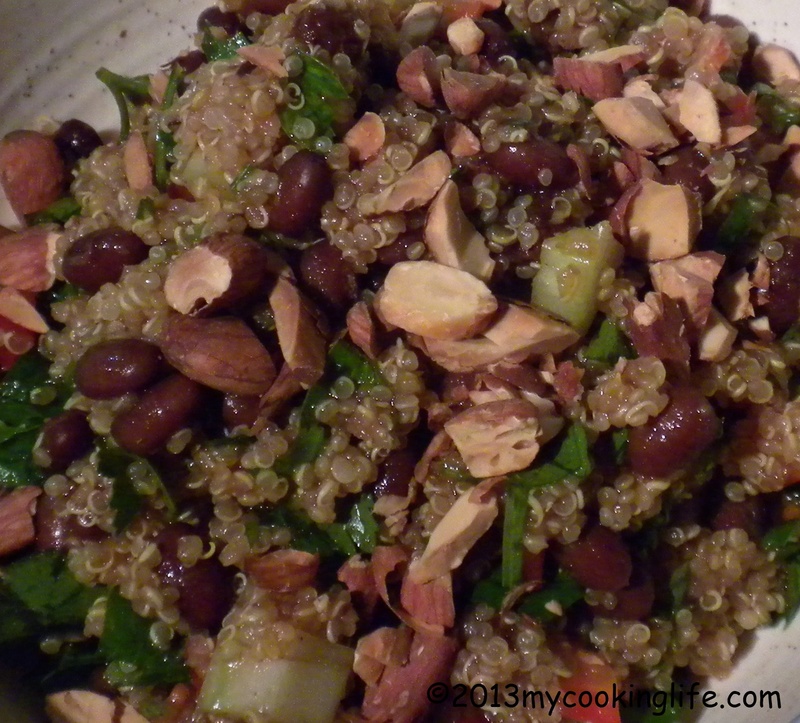 The quinoa salad is simply cooked quinoa, black beans, celery, red onion and quite a bit of parsley. I know you’ll improvise here as well! The outcome? Couldn’t get enough of this! It was nearly gone before I even had a chance to take a picture. Did you ever look back on what you’ve been cooking and notice there’s an awful lot of brown food going on? Brown rice. Toasted almonds. Roasted cauliflower. Soy sauce. Apple pie. Barley. Whole wheat bread and pasta. Nut butters. All of the above are things I recently cooked and they were really, really delicious and eaten with plenty of lightly cooked greens or salads. But I need C O L O R! My mama always said that one way to ensure good nutrition is to make sure you have a colorful plate of food. She didn’t mean the Fiesta Ware! (Although colorful serving dishes do help with the aesthetics.) I think she was wise to tell me that. I don’t go in for specially hybridized food such as the purple and orange cauliflower that I saw in Whole Foods last week. Too unnatural! 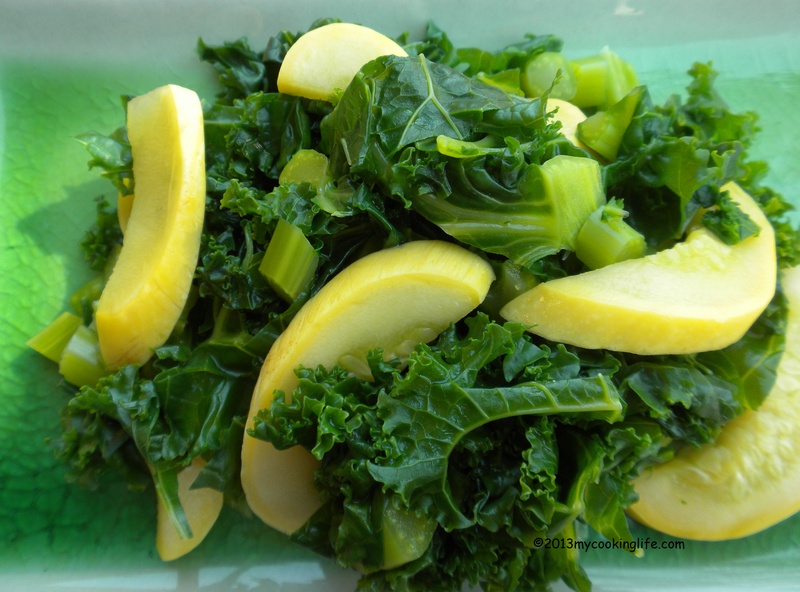 So what can be done to put some vibrant, natural color into that whole food, plant-based diet? Plenty!!! 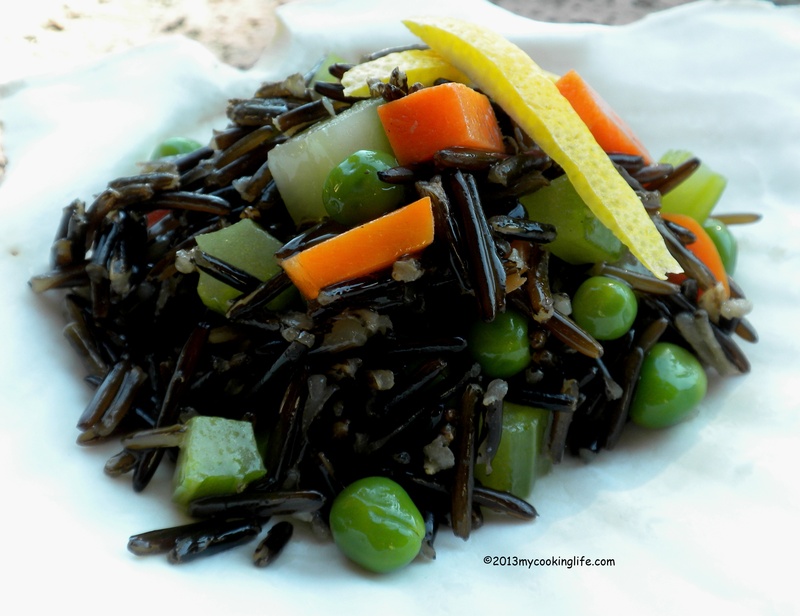 Wild rice salad with celery, carrots and peas. Dressed with a white miso, walnut oil, lemon dressing. 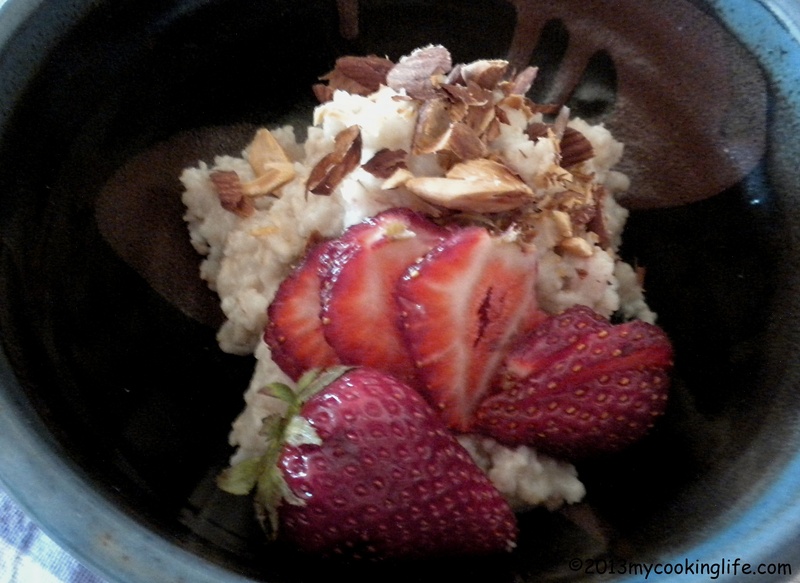 The strawberries make the difference in this bowl of oatmeal with toasted almonds, don’t they? Colorful Pico Di Gallo could put some zing in your bowl! 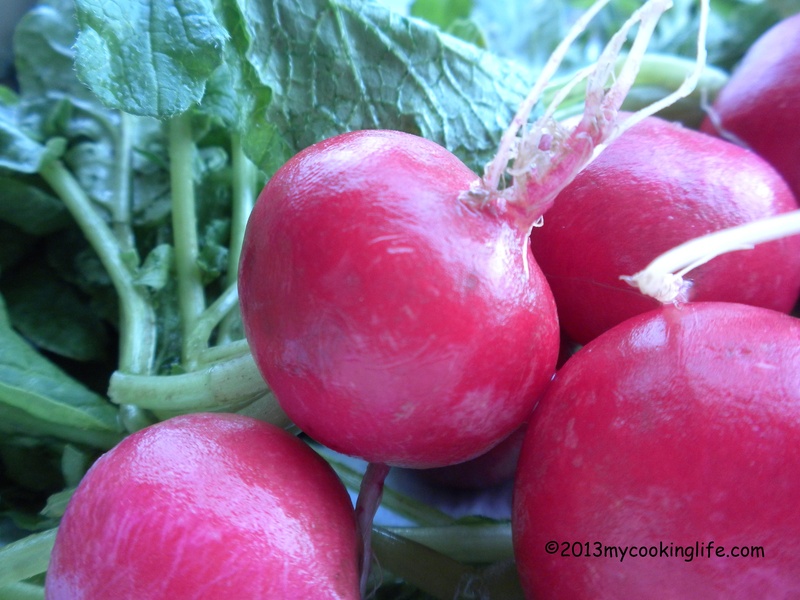 What could you do with these beauties to brighten up a meal? How about some red beans? They do wonders for this quinoa dish. Sometime try this: walk through the produce aisle of your natural food store and just look for colors you like. I learned this technique from clothes shopping, by the way, because I walk up and down those racks and when I see a color I like then I’ll take a closer look at the clothing item. Maybe you’ll find something you haven’t considered using before. As growing season is upon us here in the northern hemisphere, we can look forward to an abundance of vibrant colors to choose from! What is your favorite way to infuse your menu with color?